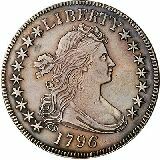 1796 16 Stars Half Dollar"
Beware of modern reproductions from the Gallery Mint of Eureka, Arkansas that have had the word "COPY" ground off and the surfaces deliberately worn down to simulate a "new" variety of the 1796 Half Dollar. The finest "15 Stars" example graded by PCGS is a single MS-64. The finest "16 Stars" example graded by PCGS is a single MS-66.